About CC - Cannabis City - Seattle's Original Pot Shop & the Friendliest Budtenders in Town! 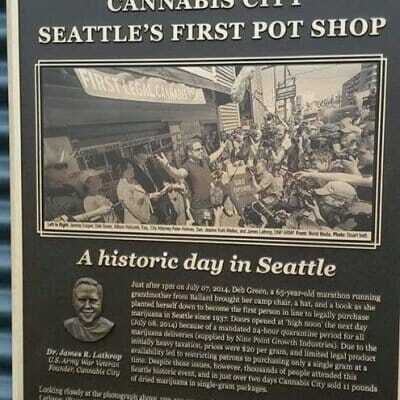 Welcome to Seattle’s Original Pot Shop! We strive to provide a broad range of quality Cannabis products to fit any budget! We are conveniently located on 4th Ave S (10 minutes south of Downtown Seattle, 15 minutes north of SeaTac/Seattle International Airport, and 4 minute walk from light rails SODO Station). We have a shared parking lot located on 3rd Ave S just behind Subway with 4 reserved spots for our customers. Prices listed on our menu include all taxes! Our menu is subject to change. Items sell very quickly. A Piece of Seattle History. Dr. James R. Lathrop is a Doctor of Nursing Practice, Entrepreneur, and US Army Veteran of Foreign War (Desert Shield / Desert Storm). James R. Lathrop, DNP ARNP opened Seattle’s first legal recreational cannabis shop on July 08, 2014, gaining worldwide media attention for Cannabis City in Seattle. Professionally he has been a nurse practitioner for over 20 years, and was the owner and clinical director of Advanced Holistic Health. Known as the Ahh! Clinic the practice specialized in cannabis therapeutics for more than 5 years. Dr. Lathrop currently is attending a PhD program at the University of Washington with a research focus on cannabis therapeutics.